Tan Chong’s story began in the 1950s with the distribution of the first Japanese car brand in Malaysia, and is today a Malaysia Top 100 company. With over 50 years of heritage, Tan Chong has grown to be a comprehensive automotive company with diverse business portfolios in automotive sales, assembly and distribution, provision of after-sales services and motor-related financial services such as hire purchase, leasing and insurance. Edaran Tan Chong Motor Sdn Bhd (ETCM), a wholly-owned subsidiary of Tan Chong Motor Holdings Berhad, is the sales &amp; marketing arm of Nissan vehicles in Malaysia. Tan Chong Group (Tan Chong Motor Holdings Berhad) & began its story in the 1950s with the distribution of the first Japanese car brand in Malaysia, and has grown to be one of leading automotive companies in Malaysia with presence in Vietnam, Cambodia, Laos and Myanmar.&nbsp; Tan Chong Group is a public listed company on the Main Board of Bursa Malaysia and is also one of the Top 100 Employers in the country. Franchise holder and exclusive distributor of Nissan and Renault vehicles as well as trucks and buses under the UD Trucks and Silverbus brands in Malaysia. 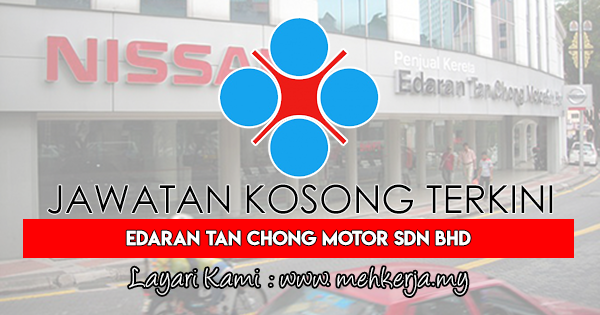 0 Response to "Jawatan Kosong di Edaran Tan Chong Motor Sdn Bhd - 3 Februari 2018"